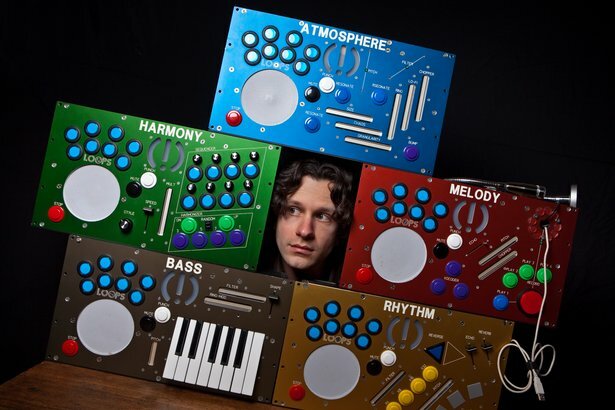 Moldover and some of his controllers. As a musician, entrepreneur, and educator, Moldover's name is practically synonymous with "controllerism", a movement around designing creative and expressive interfaces for electronic music performance. With a new course for macProVideo and an album in the works, we caught up with Moldover about his software, controllers, and playing two recorders with one's nostrils. What instruments did you start making music with? I think I was the most serious player in my entire elementary school recorder ensemble. I could play two different parts of Ode to Joy with two recorders, one in each my nostrils. They wouldn't let me do that at concerts though. What does “controllerism” mean to you? Are there any particular styles of music that lend themselves more to controllerism? Controllerism is simple. It's about making music with new technology. Right now controllers are where it's at, and so that's the name for the movement. Button-pushers, finger drummers, digital DJs, live loopers, augmented instrumentalists; we're all controllerists. The beautiful thing is that it's still new, it's still raw, and it's not about this or that style. It's about musical freedom. What are your thoughts on how Controllerism has evolved? My views of controllerism haven't changed much, but the world around me is certainly different. I played my first set as a solo controllerist at Burning Man in 2003 and had the best time of my entire life. I knew I had experienced a piece of the future of music, and I made it my goal to share that with the world. I started hacking together different controllers and software, throwing underground parties, and making my own internet videos to spread the idea. Fast forward to today, and you can stroll into any music store and buy a phenomenal controller with seamless software integration. The parties aren't underground anymore, but they're widespread and big enough to support touring artists. Nowadays I collaborate with companies to make videos, and instead of thousands, they get millions of hits. Despite the changes around me my goal is still to musically open minds, any way I can. As long as controllerism helps me to that, I'm honored to be a part of it. How does Ableton Live work with various controllers for your studio workflow? In the studio I have my performance controllers The Mojo and The Robocaster hooked up to Ableton at all times. For clip control and sequencing I have an Ableton Push, a Novation keyboard and Vestax drum controller. I'm frequently testing new controllers as well so I have plenty of space for those new or novel devices. How does your live setup work? Live is the core of my software world for writing and performing. I just recorded a two hour course for macProVideo where I go through all the details of the setup. I spend more than half the time explaining the organization and how I work with it. I think I'm using nearly every feature of Live, as well as hosting many plug-ins and custom Max4Live devices. The setup is intricate, but the ability to open just one piece of software to play a whole show is priceless. I'm always juggling a pile of projects, but right now most of my energy is going into the Kickstarter campaign for my new album FOUR TRACK. I've written loads of new songs, developed a new musical style, and created a really special new hardware instrument that is part of the album packaging. Please check out the video if you have a moment. Thanks!